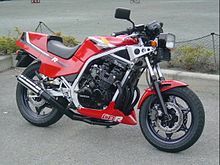 The CBR400F (NC17 ) naked bike was launched in December 1983. The 4-valves per cylinder, air-cooled, four-stroke, DOHC, inline-four engine had a rotational-speed valve stop mechanism "REV" (a prototype of Honda's VTEC system) that changed from two valves into four valves at 9,500 rpm. The following two years, it came as semi- and fully faired version as the F3 Endurance. The CBR400R and early CBR400RR models both carry the model number NC23, which makes up the first part of these bikes' frame numbers. 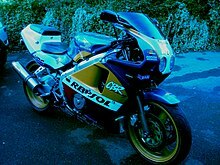 In 1986 the CBR400R was also known as Aero, Jellymould, as it shares its major design features with the rest of the early CBR600F and CBR1000F Hurricane family of motorcycles, which included significantly rounded body shapes. whereas the later 1988 model was designated CBR400RR and was also known as the Tri-Arm, after its racing inspired braced swingarm. The original CBR400F as a naked bike. Honda CBR400RR-K in Repsol livery. In 1985, Honda brought a CBR400F to the US for testing, on which Cycle World recorded a 0 to 1⁄4 mi (0.00 to 0.40 km) time of 13.63 seconds at 95.94 mph (154.40 km/h) and a top speed of 179 km/h (111 mph). ^ a b c d Hargreaves, Simon (August 1, 2016). "The Golden Age of Sports 400s". MCN. Retrieved January 9, 2018. ^ "Honda CBR400R Resmi Diaspalkan". Otosia. 2013-06-01. Retrieved 2016-07-29. 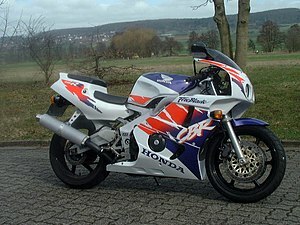 Wikimedia Commons has media related to Honda CBR400.